Just as it is pumpkin “everything” season, it’s also soup season! 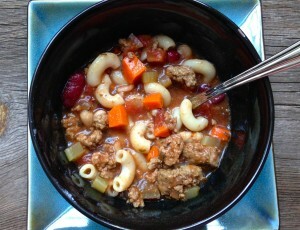 It’s not often that I would pick soup over lasagna, but when it’s Olive Garden’s Pasta e Fagioli, soup wins every time. I’ve tried to make a copycat version before (recipe HERE), and while it was good, it just didn’t taste the same. It was missing certain spices that made it taste just like Olive Garden’s. The recipe below is almost spot-on to the recipe we all love and adore from Olive Garden. If you closed your eyes, I bet you couldn’t taste a difference! While we used ground beef, I would add mild Italian sausage next time, as I think Olive Garden uses a mixture of beef and sausage. 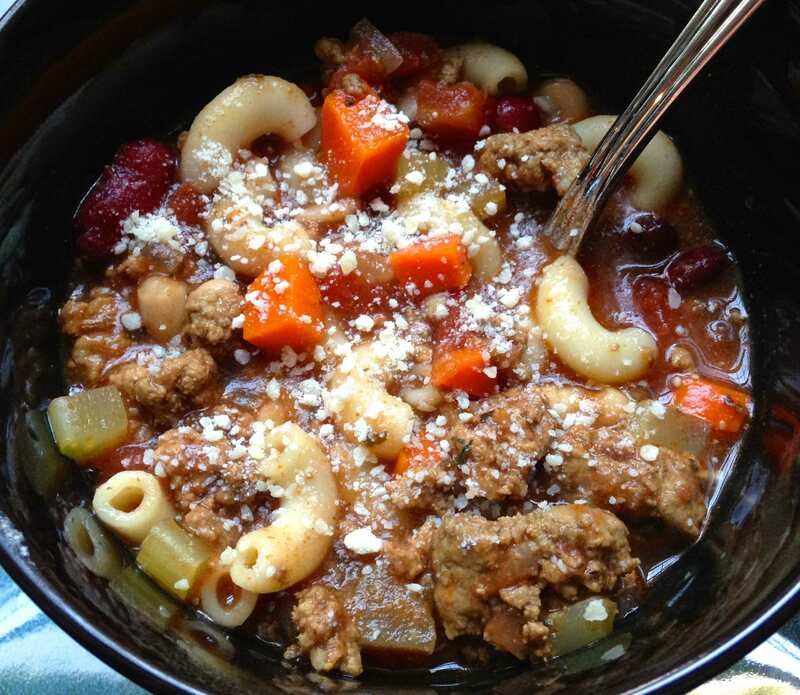 Plus, sausage adds that nice kick of flavor that beef doesn’t always provide. This copycat recipe comes from one of my my favorite blogs, Cooking Classy. 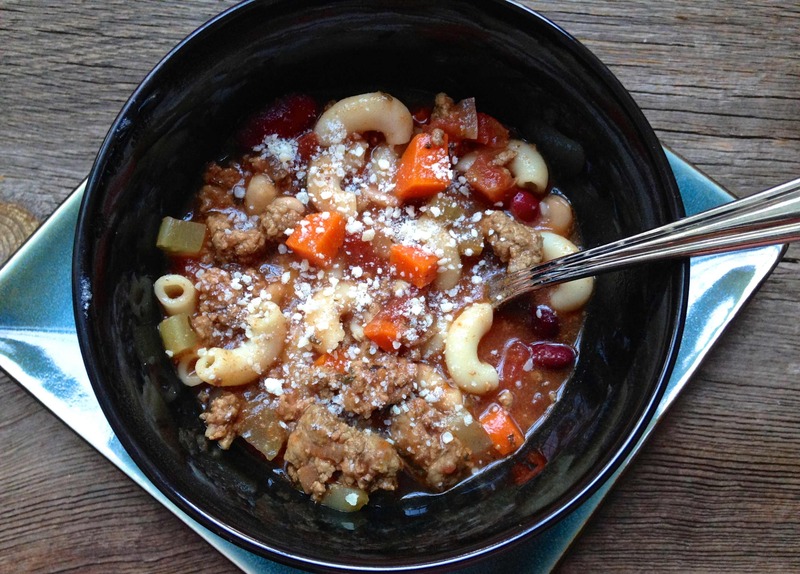 Jaclyn, the blogger, has other copycat Olive Garden recipes that I want to try such their famous Italian breadsticks, minestrone soup, and zuppa toscana soup. Don’t forget to top with grated Romano or Parmesan cheese, if desired. Enjoy! Heat 1 tablespoon olive oil in a large non-stick saucepan over medium high heat, crumble in ground beef and cook, stirring occasionally until cooked through. Drain beef and pour into a bowl, set aside. Heat remaining 1 tablespoon olive oil in same large saucepan, sauté carrots, celery and onion over medium high heat until tender, about 4 minutes. Add garlic, and sauté 1 minute longer. Reduce heat to low, add tomato sauce, beef broth, water, canned tomatoes, sugar, basil, oregano, thyme, marjoram, cooked beef, then season with salt and pepper to taste. Cover with lid and allow to simmer 30 minutes, stirring occasionally until veggies are soft. Meanwhile prepare ditalini pasta according to package directions, cooking to al dente. Add cooked and drained pasta to soup along with kidney beans, great norther beans and additional 1 cup of broth if desired to thin soup, and allow to cook 5 minutes longer. Serve warm with grated Romano cheese, if desired. The longer the soup rests, the more liquid the pasta will absorb so you can thin it with additional beef broth if desired. One Response to "Pasta e Fagioli Soup (Olive Garden copycat)"
WOW !!! You have share really superb soup and very easy to made.